Yes, we just got a foot of snow but the beauty about blizzards in February in Minnesota is that the roads clear up fairly quickly! And let’s be real, fresh snow makes everything a whole lot more beautiful, am I right? When February hits I’m usually completely over my winter appropriate clothes. Despite that facet, there’s still snow on the ground and we’re far from 80 degree days! 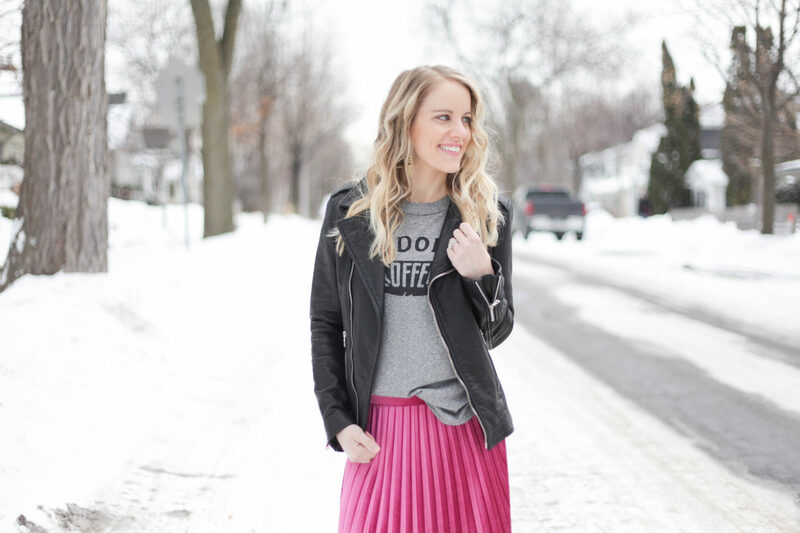 This skirt outfit was a great way for me to start transitioning from layers upon layers, down jackets and boots but still be warm and also add some bright COLOR to my outfit! I love these shoes because I can wear socks to help keep my feet warm (and in return, my whole body warm)! And the leather jacket is not as heavy as my normal winter jackets but still keeps me warm. On colder days you can add a pair of tights or scarf to keep yourself cozy when you’re outside! I’ve actually never owned a skirt this color or style before but Evereve was doing a crazy sale and it was only $20 so I took a chance on it…and boy am I glad I did! I love the fit, how it twirls and the color is perfect for welcoming spring! I think this will be in rotation all year long! nothing screams spring like bright, happy colors! there’s nothing worse than being chilled so wear shoes that you can still wear little bootie socks with – it’ll do wonders, I promise! What’s your favorite way to transition from winter to spring?